Rent Harvest Inn | Corporate Events | Wedding Locations, Event Spaces and Party Venues. Harvest Inn by Charlie Palmer is an idyllic resort designed to celebrate the vineyard way of life, with 78 luxurious accommodations nestled into five uniquely crafted neighborhoods, two secluded swimming pools, and a plush spa with indoor and outdoor facilities. Harvest Inn by Charlie Palmer belongs to the historic St. Helena community, California’s pioneering winery center that has maintained the character of its heritage stone buildings and leafy cottage neighborhoods even as the wine business thrived over the last century. Drawing inspiration from the authenticity of St. Helena’s preservation, Harvest Inn also expanded accommodations while retaining its original charm and ambiance. 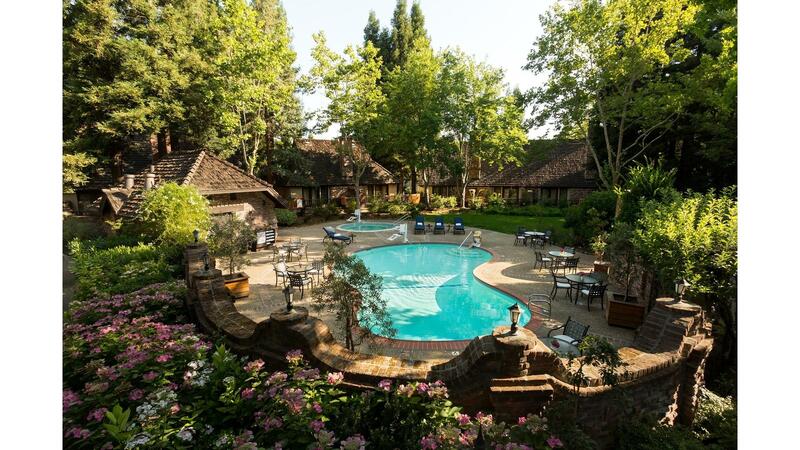 Founded in 1975 with just 25 rooms in what is now known as The Grove neighborhood, over almost 40 years Harvest Inn added three additional neighborhoods, each with its own personality, designed to offer a different experience of vineyard life. Set against the vista of the Mayacamas Mountains and surrounded by lush vineyards as well as Harvest Inn’s own magnificent rolling lawns, botanical gardens and blooming roses, Napa Wine Country weddings are an American classic, an enduring combination of luxury and ease, the hallmarks of gracious contemporary hospitality. Say your vows on the vineyard's edge and select from several naturally elegant venues for a magical wedding reflecting the dramatic beauty and romance of vineyard life.